This week's theme is: "Rainbows!" 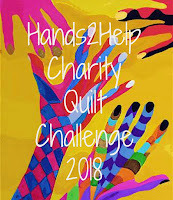 This Rainbow of Hexagons is one of my favorites made and as I skim back through my archives this week, I'm surprised to realize that it's been three years ago since I made it for Sarah's Annual Hands to Help Charity Challenge in 2015. I need to start thinking about this year's donation. of charities to choose from and perhaps think about joining us. That's a lovely way to display pieced hexagons, Val. Really pretty! I love that hexagon quilt, it's beautiful.